An advanced cream featuring two biotechnological marine sugars to simultaneously erase wrinkles, fade dark spots and brighten the complexion. ...an advanced anti-aging cream combining two biotechnological marine sugars to reduce wrinkles and fine lines, erase dark spots and restore the complexion’s youthful translucency. Translucency Cream, an advanced anti-aging cream combining two biotechnological marine sugars to reduce wrinkles and fine lines, erase dark spots and restore the complexion’s youthful translucency. Phytomer exclusive ingredient XMF (Extra Marine Filler) EPS (ExoPolySaccharide), a 100% sustainable ingredient, deposits a natural, invisible film on the skin’s surface, smoothing wrinkles in 15 minutes. * Beneath the skin’s surface, it stimulates the synthesis of collagen, elastin and hyaluronic acid for extended redensifying and smoothing results. EPS Whitech, Phytomer’s recent development, not only inhibits the sythesis of melanin induced by UV, but also offers the skin 71% more protection from synthesis of pollution-induced melanin*, preventing the emergence of dark spots and hyperpigmentation across the entire spectrum of lifestyle-related factors. 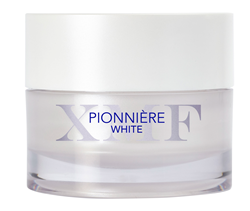 PIONNIÈRE XMF WHITE Skin Translucency Cream has a comfortable “second skin” texture and is enriched with plant oils for instant skin softness. It has a fresh scent with notes of jasmine, citrus and rose. Radiant white in color and enhanced with soft-focus powders and golden pearls, it immediately blurs wrinkles and illuminates the skin and leaves a velvety, matte finish. Day after day, a younger-looking, brighter complexion is revealed. Directions for use: Apply morning and/or evening to perfectly cleansed face and neck. May be used alone or with the serum of your choice. XMF “Extra Marine Filler”- an exclusive discovery by PHYTOMER Advanced Research, XMF is a high-tech marine sugar (ExoPolySaccharide) - a 100% natural ingredient that instantly smoothes wrinkles and redensifies the skin matrix. EPS WHITECH - limits overall hyperpigmentation by defusing the skin’s inflammatory response to lifestyle triggers (UV, pollution, stress, etc.) that underlie it. *Scientific test, twice daily application for 2 months on 24 volunteers. ** Scientific test, twice daily application for 28 days on 24 volunteers. With over 40 years as the leader in the marine skin care, Phytomer is now a pioneer in the field of marine biotechnology, the future of results-oriented cosmetics. This is the newest technology to create innovative, 100% natural skin care ingredients. Based in Saint-Malo, France and distributed in 70 countries worldwide, Phytomer has a reputation of eadership and expertise within the spa industry. With Phytomer meaning “plant of the sea,” we utilize seawater, seaweed or seaside plants in every retail and professional product, combining science with the natural powers of the sea. We are one of the only spa brands with our own laboratory, allowing us to research and cultivate our own ingredients, develop unique cosmetic formulas, manufacture skin care products and create cutting-edge professional treatments to deliver remarkable results.